I haven't managed to do any imaging for almost a year but in the meantime, I have some new gear. I now have a Meade ETX 125 telescope, a Toucam black and white modified SC1a webcam and a laptop running XP, with far more RAM than the old Windows 98 laptop which I used before. I also have a JMI electric focuser for my ETX which makes things very much easier. Here are the first images I managed to produce with the new setup. The seeing was pretty poor so the images in the .avi files were jumping all over the place and I couldn't get the exposures they way I wanted them. 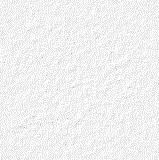 Each image was produced from a 60 second .avi file at 5fps, 300 images in total. The images were aligned and stacked with Registax4, which chose about the best 30 images from each set of 300. The final image was produced using Levels and Unsharp Mask in Photoshop. Move your mouse over each image to see labels for some of the features, move the mouse away to see the unlabelled image. The Lunar Alps form the northern boundary of Mare Imbrium. The Alps are 250km long and just 2 to 3.5 km high along their southern flank, in spite of the length of their shadows. To the north of the peaks lies a huge boulder field of ejecta from the Imbrium impact.The linear feature running across the boulder field is the Alpine Valley, a 180km long, 10km wide grabben, a faulted part of the Moon's crust. The crater Cassini has been flooded by the lavas which fill the Imbrium Basin. The two small craters within Cassini are 9 and 15km in diameter. Mount Piton is a 2400m high rounded hill but in this light, it looks like a towering peak. Furhter north, Mount Pico's summit is just lit by the lunar dawn, visible as a faint speck at about 4 o'clock from the "o" in Pico on the label. 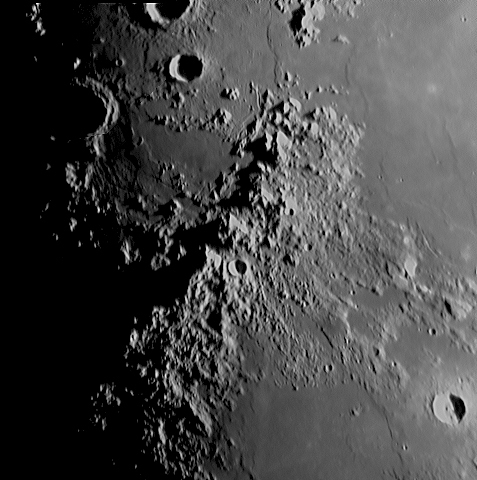 The Apennine Mountains make up the south western boundary of Mare Imbrium. The crater Conon must have been created some time after the Apennines formed, perhaps due to a large lump of Imbrium ejecta landing in the mountains. A wiggly line in the flat region to the south of Conon is known as the Conon Rille, a channel gouged out by a lava flow. 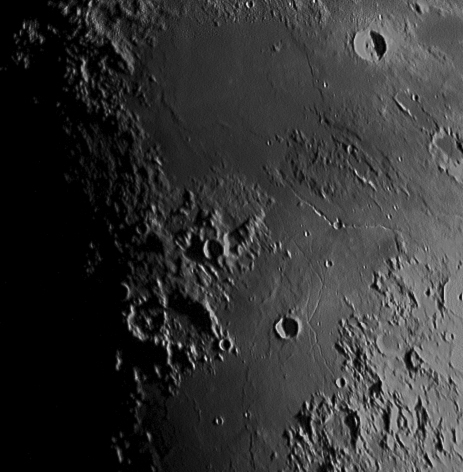 The large crater Archimedes has just its western walls lit but between it and the Apennines a number of other rilles show up well. One set is radial to Imbrium, the other, concentric. 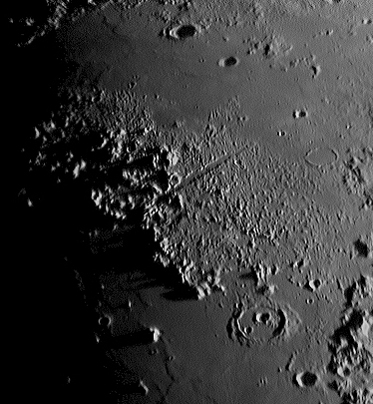 Another rille, the Hadley Rille can be seen starting at the north end of the Apennine chain, winding its way along the eastern flank and into the bay area in the mountains to the west of Archimedes. This is where Apollo 15 landed, in the shadow of the 4000 metre high Mount Hadley, next to a 1km wide rille. Rather them than me!! 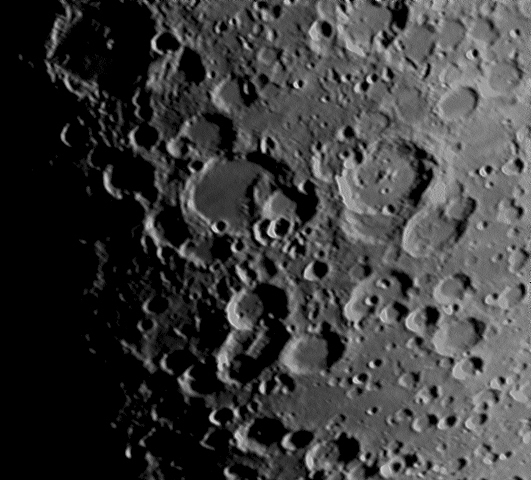 This part of the Moon is just to the south of the image above, both images contain the crater Manilus. Near the centre of the image is the mysterious Hyginus Rille with the 9km diameter crater, Hyginus at the junction of the two branches. This rille is formed from a chain of collapse pits so it was probably not formed from a lava flow. It could have a volcanic origin but the jury is still out. The crater Triesnecker also has a number of rilles nearby forming a complex intertwining pattern. The crater interrupts one of the rilles so it must have formed later. West of Triesnecker lies the carter Pallas with a central peak and the much older Murcheson with its heavily degraded walls. To the north, the 24km Ukert is obviously fresher and newer. Sinus Medii in the southern part of the image shows some wrinkle ridges in its lava field. Walther is a strange looking crater with rectangular walls but perhaps it is just a trick of the light. Rukl has a "t" in Walther, Moore does not. Stofler has a lava flooded floor with Faraday overlying part of its walls. Maurolycus has a central peak and a number of small craters on its floor. Heraclitus is an ancient crater with a central mountain range. Licetus and Cuvier with its lava flooded floor are younger craters.